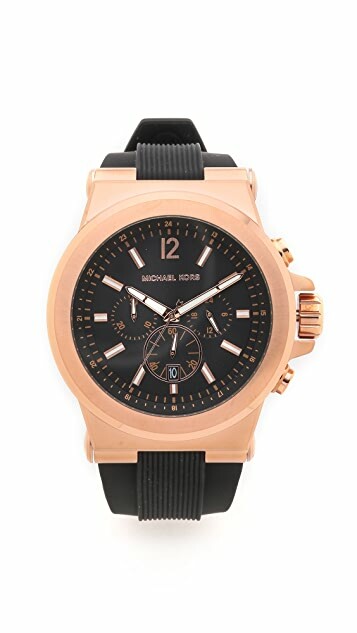 This oversized watch features a rose gold-tone stainless steel case and a textured silicone band. Chronograph and date wheel at face. Adjustable length and buckle closure. I love big watches are they sit well on my wrists but this watch (while beautiful) is really big and heavy. Love the rubber strap though. Good for sporty casual days. I expected this lovely watch to be over sized but I have exceptionally small wrists so since it's a little heavy it keeps turning on my hand, otherwise, it's really trendy and also looks great on my boyfriend! The watch looks perfect and expensive, but when I just about to put it on, one of a screws on the corner of the face came off already! Really disappointed at the quality and definitely send it back right away. This watch is great. 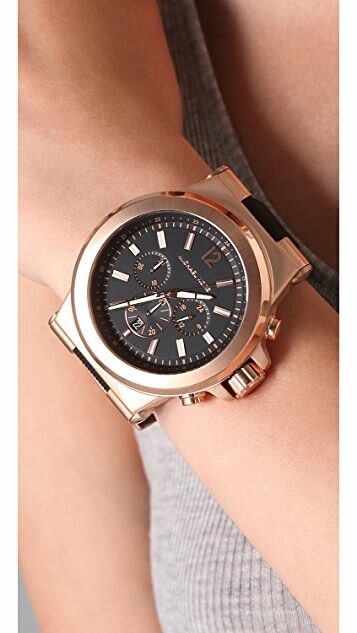 Very heavy and will slide around your wrist but it looks amazing on. Well worth the purchase. Love this watch. It's huge but it looks so good! I'm quite tall (175cm) and I think it would be way too big for a petite person. Beautiful, beautiful watch! 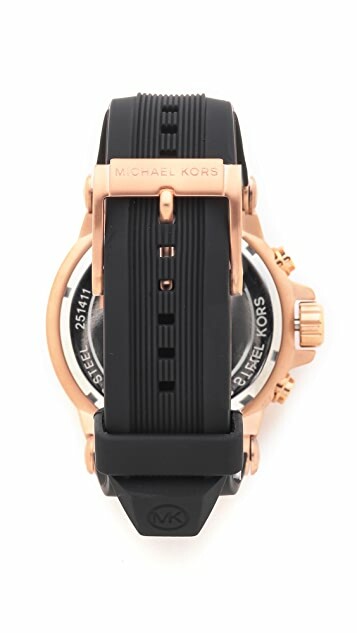 If you like oversized chunky watches then you wil LOVE this MK watch. Fits comfortably around my 15 cm wrist with plenty of holes to spare for a larger wrist or a looser fit. Be aware that it is a heavy accessory but very comfortable to wear. Strap is a soft bendy silicone (although the strap does have a slight plastic smell, which i'm hoping will fade overtime). The rosegold is beautiful. The face is easy to read and great attention to detail. Arrived packaged securely and came in the original brown MK box, great as a gift. Delivery was extremely fast, ordered on a Tuesday arrived on Friday. So happy i bought this watch, look forward to adding another MK watch to my collection in the future. Thanks Shopbop. Really big..fits my wrist and do not need readers to see the face..very fashion forward.. Not for small women. you know you want it. get it. this is the greatest watch i've ever seen. it's huge but didn't need adjusting. got tons of compliments. i see many long nights of time telling in my future with this one.